71% of Americans trust their providers with their medical information much more than they trust payers (43%), state and local government (31%), private information technology companies (27%) or the federal government (27%). Americans consider the privacy of their healthcare information important, with 75% wanting providers to ensure the privacy of their health care information. 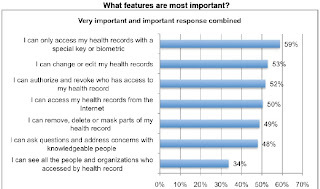 Features considered more important by patients included biometric or key security (59%), ability to change the health record (53%), access authorization (52%) and access over the Internet (50%). Andy Greenberg (Forbes) concludes that "the biggest controversy over electronic health records may be aimed at tech companies' projects such as Microsoft's HealthVault or Google Health, both of which are designed to act as online interfaces to a Web user's medical information. Asked to rate the sensitivity of various types of personal information, users rated health records as far more sensitive than other information they typically share with Web companies. On a scale from one to seven, medical data received an average rating of 6.64, while credit card information received only a 4.27 and online search records just a 1.86." The survey introduced bias by telling repondents that the the U.S. government is considering implementing a national database for the management of health records - - a representation that is misleading at best. The study, ostensibly sponsored by the Crowe Horwath accounting firm, doesn't indicate who might be behind Crowe Horwath's interest in this topic. I think that when it is explained to the general public that there will be many safety features to assure their electronic medical records will remain private, most of them will feel more secure. There is always of course the risk of a hacker but it isn't something the general public should get too worried about. Unfortunately, I'm sure the media will fan the flames regarding this issue. I have been a director of a medical records department and keeping medical records secure was our primary concern. When the record is in the health information department in a hospital, it is very secure. Staff in medical records are very careful about requests received for information from medical records. What people don't realize is that with physical medical records once they are checked out by a clinic or a doctor, may end up in many different hands. The doctor and staff is not allowed to take the medical record from the facility but it does happen occasionally. Doctors offices are pretty good about not giving the patient their own records but I as a patient have found that my records have ended up in various places that have been of some concern to me. The worst was when I found out that my ex husband's lawyer had copies of my records from a psychologist I had been seeing. Whether the record is in paper form or electronic form, it is up to health care providers to assure that patient's records are secure. I think it is a good idea for patients to have a copy of their own electronic medical records so they can take it to whatever health care provider they need to.